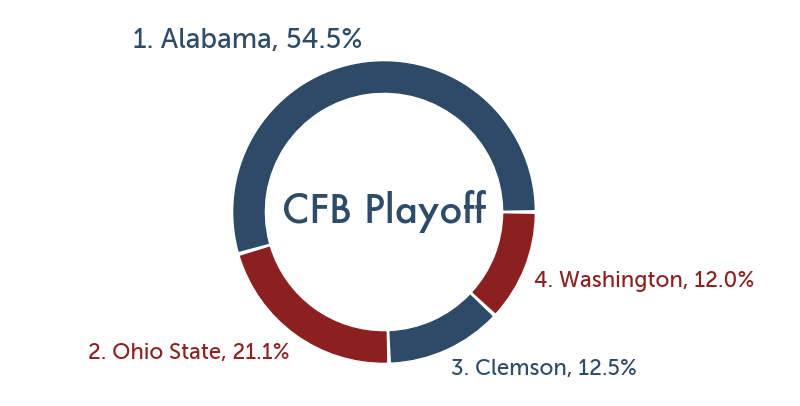 Alabama and Georgia meet in the college football championship game, and my member numbers predict Alabama by 4.2. I often make this prediction with a certainty that the most likely result is an Alabama win by 4. However, posting a single number is deceiving. There’s uncertainty in making a prediction, whether by analytics or the markets, and no one talks about it. To illustrate this uncertainty, let’s look at Alabama. To close the 2016, Alabama met Clemson in the college football championship game. The markets closed with Alabama as a 6.5 point favorite. Alabama lost a close contest to Clemson, but that didn’t dampen the enthusiasm for the Crimson Tide heading into 2017. The hype for this dynasty reached a fever pitch when they destroyed Vanderbilt 59-0. In November of 2017, the markets made Alabama better than even odds to win the college football playoff. Think about this. If you ask yourself whether to take Alabama or any other team to win the playoff, the markets favored Alabama. It didn’t even matter that they had yet to make the 4 team field for the playoff. Then the Auburn game happened. Alabama lost 26-14 on the road to their arch rival. This one game changed everything. With the loss, Alabama didn’t win the SEC West. Instead, Auburn won the division and played Georgia in the SEC title game. Alabama no longer controlled their playoff destiny, and they sat at home sweating it out on championship weekend. Lucky for the Crimson Tide, two of the top 4 teams lost on championship weekend. The debate about the last playoff spot came down to one loss Alabama that didn’t win their division against two loss Ohio State that won their conference. The committee picked Alabama, and they were slated to face Clemson again in the playoff semi-final game. The markets closed with Alabama as a 3.5 point favorite. Remember, Alabama was a 6.5 point favorite just a year before. I personally find this swing in point spread insane. Alabama improved from 2016 to 2017. By my adjusted yards per play, they had the top defense both seasons. But QB Jalen Hurts developed as a sophomore in 2017. The offense jumped from 12th in 2016 to 8th in 2017 in my adjusted yards per play. On the contrary, Clemson isn’t the same team as last year. Their defense has arguably improved, but they lost a generational talent in QB Deshaun Watson. What was the real cause of Alabama going from a 6.5 to 3.5 point favorite? In 2016, Alabama scored 15 non-offensive touchdowns. This made them seem invincible both to the eyes as well as points based analytics. This preseason, I wrote about how this scoring production from defense and special teams was irreproducible. In 2017, Alabama had 2 non-offensive touchdowns, and one came on an interception against Clemson. The second factor in this point spread swing? The loss to Auburn. Alabama was undefeated in 2016, but had a blemish in 2017. The difference in Alabama versus Clemson suggests at least a 3 point uncertainty in making predictions. Now, how about Alabama versus Georgia? The day of the game, Alabama is a 3.5 point favorite, with a few sports books at 4. This is close to my member prediction Alabama by 4.2, which suggests no value in this game. But, if Alabama had beaten Auburn, they would have played Georgia in the SEC championship game. In fact, they would have played on the exact same field in Atlanta at which they will meet for the playoff championship game. If Alabama had played Georgia in the SEC title game, Matthew Holt of CG Technologies, the guy who sets the line in Vegas, says Alabama would have been a 7.5 to 9 point favorite. This suggests one game against Auburn shifts the spread by up to 6.5 points. Auburn was a big data point for Alabama, as the Crimson Tide lost to the best team on their regular season schedule. However, this loss should not imply a shift of 6 or more points in the Georgia prediction. There is uncertainty in making football predictions. Alabama enters the 2017 as the preseason favorite to win another national title. Nick Saban’s team tops my preseason college football rankings with a rating of 22.7 points better than the average FBS team. However, no college team does not have their problems in August. Let’s speculate at what could go wrong for Alabama in 2017. Another 6 players went by the middle of the 4th round. However, Alabama always loses NFL talent but reloads for the next season. Let’s try again. Perhaps the offense stagnates under new coordinator Brian Daboll. This guy didn’t exactly light it up as an NFL coordinator, as these NFL rankings out of 32 teams show. Since this meager run as coordinator, he’s been working under Josh McDaniels on the Patriots staff. Daboll’s track record should concern Alabama fans for the upcoming season. But there’s another, much worse factor lurking in the background. The one thing that will go wrong for Alabama in 2017 is that they won’t score 15 touchdowns on defense and special teams like they did in 2016. Fifteen!! That’s an insane number of touchdowns. I broke Alabama’s non-offensive touchdowns into four categories based on this video. You might want to give them credit for the punt returns. Fine, let’s do that. The Alabama defenders barely had to move for those 6 interceptions, with the exception of Minkah Fitzpatrick’s pick that he ran back over 100 yards for a touchdown. Can they get opposing QB to be this generous again in 2017? As for the 3 fumble recoveries, analytics has found almost complete randomness in fumble recoveries. Alabama had good fortune in recovering those last 3 fumbles, and even more luck when those players stayed on their feet to run back for the touchdown. And the 3 deflections are dumb luck. Should Alabama be the top ranked team? Of course. Will they win the national title? The markets give Alabama about a 28% chance. But will Alabama score 15 non-offensive touchdowns in 2017? No. Alabama projects to win 10.1 games by my preseason numbers. You can get all 130 win totals in The 2017 College Football Win Totals Report. To get this free report, sign up for my free email newsletter.